March 7, 2015 - SOLD OUT! Daphne was born on May 4, 2012 to D&S Benelli's Mae Dayz MH (Ellie) and FC Tribute to Justice (Honor) owned by Susan Bledsoe of Justice Retrievers. Daphne runs awesome blinds and really turns it on in the field. In the switch of a button, she is a loving and calm companion to her family. Daphne earned her Senior Title in 2014 and is continuing her training to run Master tests in 2015. Daphne has great potential and is a dream to have in training. Daphne is owned by Randy Beach. Yella is a handsome, 80 pound black male that is very intelligent on blinds and marks and runs with high drive and intensity. Yella ran 2 Derby's in 2008 and finished with a 4th and a Jam. In 2009, he Qualified All-Age (QAA) @ 28 months old. Yella achieved his Master Hunt Title by 3 years old. 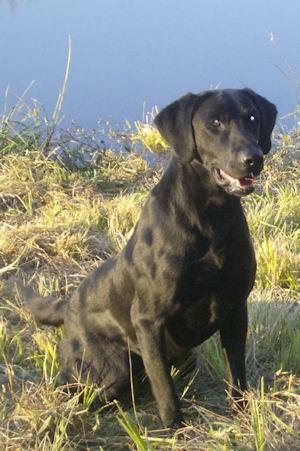 Yella ran an Open All-Age at North East Tennessee Retriever Club in 2013 and received a Jam. Yella is continuing his training and is running field trials in 2014. Dew claws wore removed on March 10, 2015. Pups will be wormed at 3, 5 & 7 weeks of age, and pups will receive their 6 week vaccines and be vet checked and certified by Dr. Sam Yoder of Silver Maple Veterinary Clinic. Born and raised in our home....well socialized. Ready for new homes around April 24, 2015.